Why Table at Library Cons? I’ve really grown to enjoy tabling at small, local library shows. It’s a great laid back way to earn extra income on a Saturday and has proven a fantastic way for me to sell copies of 7″ Kara to an audience interested in children’s comics. Library cons are often free (or very inexpensive!) to table at, free for the public to attend, and are a low stress tabling opportunity for artists and self-published creators. 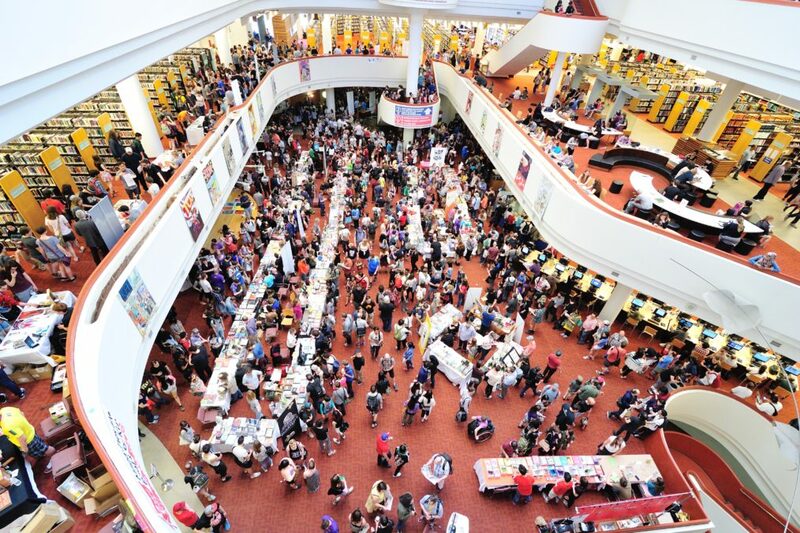 If you’re a comic creator who prefers to sell comics over other types of merchandise, library conventions are a perfect way to attract a literature-loving audience, and can be a wonderful first convention opportunity for newer artists. For me, library conventions offer another bonus- I get to meet and chat with librarians who are interested in children’s books and children’s comics. I get to serve as an advocate not only for my own work, but for other kidlit creators who deserve recognition but may not have the opportunity to make such connections. To see example set-ups for library conventions and more, visit the original post here.